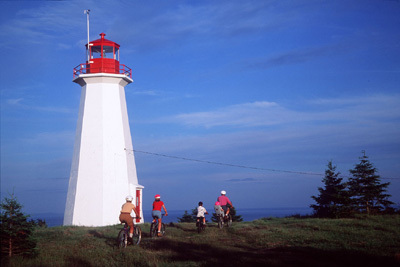 For local tourist information, go to Cape-George-Point-Lighthouse . The first light, erected in 1861, was a square white wooden tower. In 1908, it was replaced by an octagonal wood tower, painted white, with a circular red metal lantern. The current light, the third on the site, is the octagonal concrete tower built in 1968 shown in the image above. It is 45 feet (14 m) high with a group flashing white (12s) electric light. The lighthouse stands on a high cliff above the strait. 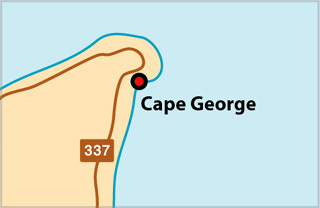 Cape George Light stands on the precipitous 660 foot (183 m) headland of the same name at the entrance to St. Georges Bay. Light Height: 350ft feet above water level. Light Height: 360ft feet above water level. Light Height: 404ft feet above water level.